A 64 -year-old man has been rescued after a failed attempt to walk to refuge from his home in the south of Scotland. He had been without power for seven days in the house near Eskdalemuir when he tried to reach the very near village. After four hours of striving through deep snow he had called for help. Darkness had descended on Sunday when Moffat Mountain Rescue Team arrived in the area. They spent two hours combating through impetus before receiving him. The man was eventually taken by 4×4 vehicle to Lockerbie. 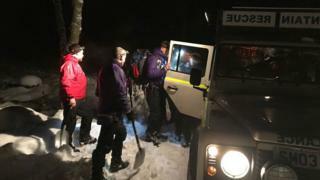 The team were called out again some hours later to take part in an operation with Tweed Valley Mountain Rescue Team and Police Scotland to find two baby-walkers on the Southern Upland Way. The search for the walkers began at 00:10. They were eventually find, uninjured, at 05:30. Throughout Sunday, heavy snow has caused travel chaos on superhighways in Scotland as motorists faced hazardous driving problems as the weather deteriorated. Five beings were hurt in a two-car crash near the Glencoe Mountain Resort on the A82 on Sunday. Local police asked motorists to avoid the neighbourhood, who described the conditions in the area as “extremely poor”. At the high levels of the problems at Glencoe, the road was closed while police dealt with the aftermath of the accident.